As consultants strive to keep ahead of trends in AV technology, industry manufacturers are stepping up their training to assist in this effort. Today, consultants can choose from a growing array of educational opportunities and formats suited to their busy schedules and to their need for forward-looking knowledge. SVSi, for instance, offers consultants traditional lunch and learns, online training and regional training options, in addition to intensive two-day training sessions at SVSi’s Huntsville, AL headquarters. These alternatives give consultants the ability to learn at the depth and pace of their choosing. They can also selectively attend certain aspects of training sessions that predominantly serve an integrator audience. Michael Frank, sales development director of Eastern North America for Biamp Systems, agrees that many consultants are generally less interested in the minutiae of how to make the products work. The notable exception is consultants that are now bringing programming services under their portfolio. Ryan Baumann, regional sales manager for enterprise accounts at Crestron, likewise sees little interest from consultants in Crestron’s programming certification courses, with the exception of those consultants. Frank also finds that consultants aren’t as concerned with the ‘sell’ of the product. “What they are really interested in is convincing somebody that what you have is different from what’s out there. And in many cases, they would rather have that be more technical, so they can choose to dumb that down if they want to,” Frank said. As the convergence of AV and IT has become reality, consultants are also increasingly looking to manufacturers to help them acquire that knowledge. “We’re seeing a big thirst for a deeper understanding of network fundamentals, advanced network considerations and IT security,” Templeton said. And, as more consultants with IT backgrounds move into AV, Baumann is seeing those consultants show interest in training on areas they’re less familiar with, such as video distribution systems. Frank is additionally seeing consultants getting creative and seeking knowledge on how they can tie technologies together to expand on a product’s application. He’s also seen a strong consultant response to a “How to Speak Intelligently to IT People” course, which Biamp recently introduced. Given the demands on consultants’ time, online training has proven to be an exceptionally popular option for consultants. In response, manufacturers are rapidly increasing their suite of online course offerings. Baumann estimates that Crestron has eight to 10 online courses available now, with several more on the way. Templeton believes in the value of training delivered by a live moderator because it allows for Q&A and a more hands-on approach. But online training has enabled SVSi to reach a far wider audience. “We probably reach 20 times more people through our web-based training than we do through the rest of our training combined,” Templeton said. The online modality also enables consultants to go back and view updated versions of their completed courses as new technologies emerge. Baumann noted, for instance, that many of Crestron’s online courses have been updated over the past six to 12 months, and that a supplemental online guide to 4K for previous students of the DigitalMedia course has been hugely popular. 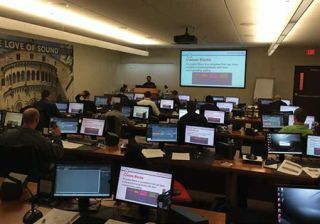 Companies like Crestron, SVSi, and Biamp strive to provide consultants additional value in the training by making their formal offerings eligible for InfoComm CTS program renewal units whenever possible. They’re also seeking to provide additional practical support through just-in-time resources that consultants can turn to as needed. At Biamp, Frank sees this happening through things like YouTube videos and design guides, and also through ongoing support of consultants after training when they go to implement their new knowledge into a design. Chris Gelbach writes on diverse topics that include careers, marketing, the AV industry, and recreation management.